The history and culture of the Hawaiian islands is a major part of what makes the region so fascinating. The islands are a melting pot of international cultures and heritage that have come together to form a unique blended society. Both in Hawaii's history and present day time, arts and entertainment have been key in portraying the culture of the Aloha Islands. Before the first words were ever written in Hawaii, the art of storytelling played a significant role in keeping the history of the islands and their people alive. The orators of Hawaii were considered living libraries, as they had to memorize and recite extensive accounts of historical events, legends, and other folklore. The ancient inhabitants of Hawaii believed that words held tremendous, and even supernatural, powers used to communicate with their gods and goddesses. They believed that the power of words brought knowledge that must be protected from all but the islands' high priests. Therefore, the Hawaiians didn't develop a written language until after the arrival of Western culture. With the arrival of many foreign cultures to the islands, the native people found it necessary to learn how to read and write in order to understand the ways of these newcomers. Since then, reading, writing, literature, and the desire to learn spread throughout the islands like wildfire. The early islanders used the power of words in religious ceremonies and other celebratory events, where they combined the spoken word with music and dance. 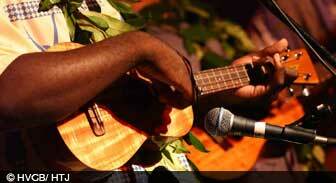 Hawaiian folk music was used for many different occasions, particularly to express emotions. One of the most popular Hawaiian music performances is the hula. This particular style incorporates dance choreography, harmonies from various instruments, and chanting. The hula has helped gain worldwide popularity for the music of Hawaii. When most people think of Hawaiian harmonies, the instrument that comes to mind is the ukulele. Along with traditional island music, there are several other genres of music that are popular on the Aloha Islands including jazz, hip-hop, and Jawaiian, which is a combination of reggae with Hawaiian sounds. Annual music festivals are held throughout the year on the islands to celebrate the sounds of Hawaii's diverse music. Just as captivating as its island melodies is Hawaii's indisputable beauty. Hawaii is very well known for its gorgeous natural landscapes and tropical scenery, which have not escaped the eyes of artists. The visual arts have a special place in the culture of the islands, especially on Maui, Oahu, Kauai, and the Big Island, which all have a large number of museums and art centers. There are plenty of festivities focused on art to be enjoyed while visiting Hawaii. Not only has the scenery of Hawaii captured the attention of artists, but its natural beauty has lured in filmmakers as well. The film history of Hawaii goes back to even before it became a part of the United States. From soundless short flicks to feature length mega-films, Hawaii has been the stage for numerous movies and television shows. Along with the big-screen and television, Hawaii also has a number of performing arts theaters where live dramatic performances take place. No matter if you love theater, still life, oil paintings, or novels, Hawaii's arts and entertainment has a little of everything, so you can learn more about the culture of the islands while being thoroughly entertained.